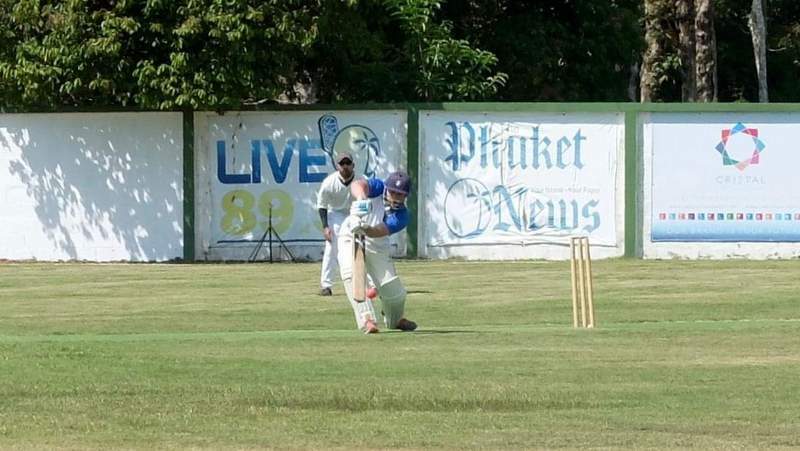 This week’s matchup between The Phuket Misfits and Patong CC had both teams looking to build on their opening round narrow victories over The Goan Panthers. Mudasir Rehman would get to dictate terms by winning the toss and electing to bat. The Misfits, sent in Jeremy Bootsy, to be joined this week by new father, Manish Sadarangani, who would be proudly batting for the first time in front of his new baby boy who was alongside mom, settling in for the day in the clubhouse. The Misfits, with a mix of positive running and patient aggression, blunted the opening bowling attack of Patong, as they began laying the platform for a potentially big score. The score would tick on past the 56 mark before Patong would breakthrough, as the much-improved Delano Buchner would eventually get one of his lightning bolts through the defences of Bootsy (30) to send the off-stump tumbling past the wicketkeeper. Buchner (2-22) would pick up the second wicket in the same over as he was too quick for K Steve, having him caught in the slips for a duck. Sameer Khan (1) would follow shortly after as he deflected the ball off his heel onto his stumps to give Ike Bekker his first wicket. K Ali joined Manish who was standing helplessly at the other end as the carnage ensued. K Ali showed intent from ball one as he first swung and missed, before perfect contact with his second ball faced, sending a Bekker (3 for 40) leg spinner sailing over the fence and into the dam. One more perfect swing would connect for K Ali (13) before he would hole out to P Ledeboer who, knowing the importance of the catch, celebrated with gay bounding enthusiasm belying his advancing years and heavily strapped knee. And, just like that, The Misfits were now reeling at 74 for 4. 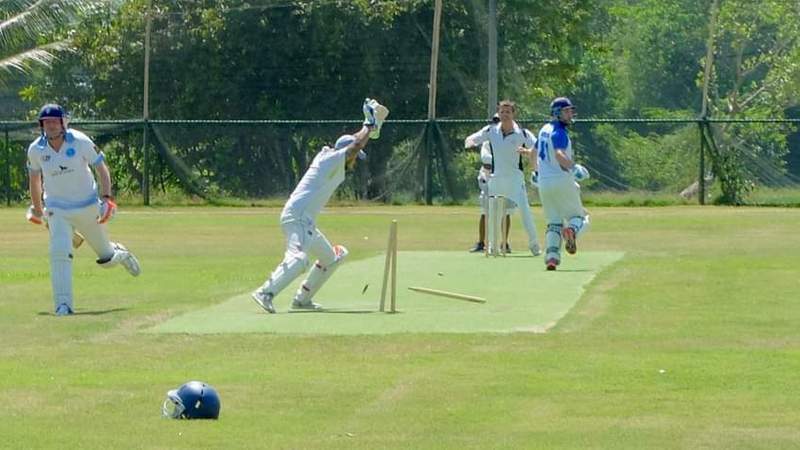 Captain M Rehman had seen enough and strode to the wicket, intent on wrestling back the momentum and sent the first ball he faced over the fence for six off the hapless Robertson. M Rehman (31) played a beautiful cameo inning, including three sixes and a boundary before he was removed by opposing captain S Raju (2 for 12). Rehman would be the final resistance for the Misfits as they regularly lost wickets and were left to rue the fact that they left the destructive Rishi Sadarangani stranded, without facing a ball, as Tyler Whateley (3 for 12) came on and destroyed the tail-enders with a devastating spell of bowling that disturbed the stumps of two batsmen and had the third, athletically caught by the sure hands of all-rounder and part-time radio model, Jason Robertson, to end the innings at 146 all out. 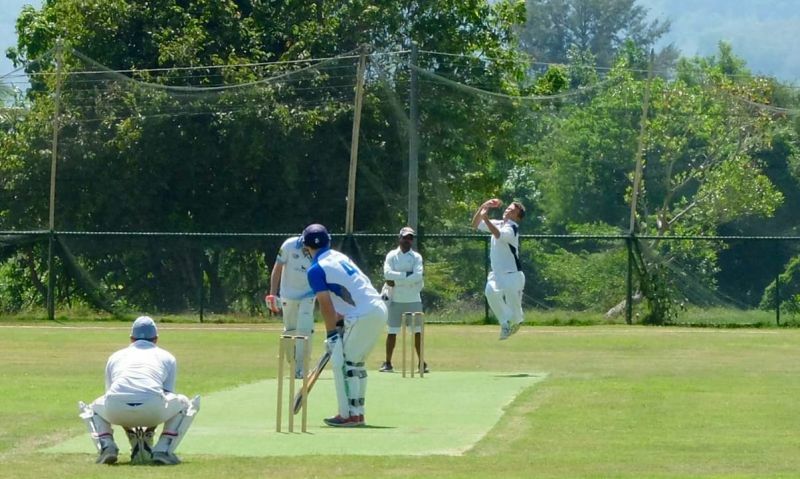 Patong would be hoping that their ill-discipline in their bowling would not come back to bite them in the end as the top scorer for the Misfits were the 39 wides, they had bowled. Patong, needing just over four runs per over to win, required discipline and resilience from their top order. What they got, however, would be the exact opposite as firstly P Sami would end the fine run of form of regular opener H Flowers (0) as he was clean bowled. Then, P Sami would strike again as next to go would be other opener Ike Bekker (2) who showed little regard for his wicket and seemingly the teams’ best interests, as his only two runs came from a behind the back circus shot that had half his teammates scratching their heads in the clubhouse as the other half multi-tasked by shaking their heads while running for the changerooms to pad up. The Misfits, smelling blood in the water, were not done with the destruction as they first had Ledeboer (1) run out by a direct hit from K Steve, then T Whateley (0) caught and bowled and finally F T Van Blerk (0) adjudged LBW for a double strike for A Du Pont. Suddenly Patong was reeling at 10 for 5 with C Morgan watching in disbelief at the non-striker’s end as his top order were all back in the dugout. Morgan, however, did have the relief in knowing that this week instead of the absurdity of Sibabalo Gxasheka coming in at number 7, who the previous week had made a golden duck, rather had the confident strides of his captain S Raju swaggering to the middle. Morgan who had shown flashes of talent in his first handful of games for his new club was due a big score and alongside his captain, set about rebuilding the innings and turning the momentum. S Raju (23) in a welcome return to form, played some delightful strokes in moving the Patong retort to 66 before he was dismissed LBW by M Sadarangani to bring up 66 for 6. Ironically with three 6s, up on the scoreboard, the darkness would descend on the Misfits as J Robertson strode to the crease, helmet and bat in hand, as if he was a Viking about to invade Wessex. With the game still very much in the balance, the new pair were allowed to rotate the strike at will as the Misfits had their fielders patrolling the boundaries awaiting the miscue. J Robertson (25*) dispatched M Rehman into the snake pit for a maximum, which was Robertson’s only real contribution as it quickly became the C Morgan (75*) show as the southpaw manhandled every bowler that came at him with some devastating leg side stroke play that with a barrage of sixes, dwarfed the Misfits total and took the Patong side to a memorable win that at 10 for 5 had looked very unlikely. C Morgan was rightly adjudged man of the match. Although there was some important contributions from the millennials in D Buchner, T Whateley, Ike Bekker and elder statesman S Raju.